I just want to remind you that there are only 2 days left to apply for the Design Team Call. You can check out all the details by clicking the graphic above this post. "this is going to be waaaaaay too hard!" Then, I remembered I'm the boss! If I don't like the rules I can change them! LOL! So I decided to double it! I will be adding 6 new designers to the team!!! I mean really, what do you have to lose besides the time it takes you to send the email?? 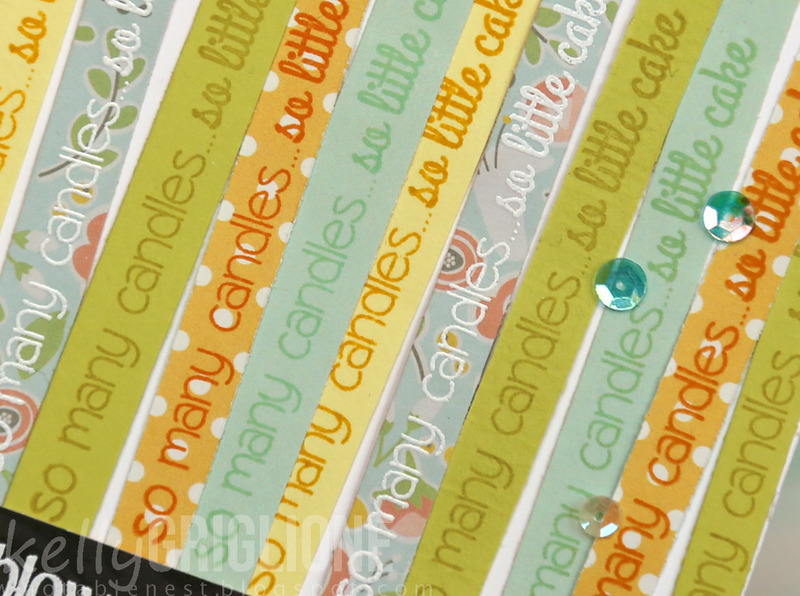 Kelly here to share a birthday card that you can make with any long, birthday-themed sentiment. 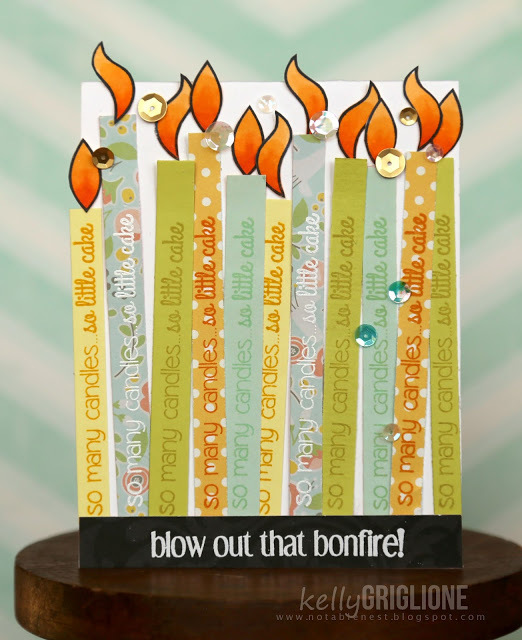 The bottom "blow out that bonfire" sentiment is from another birthday set, Shenanigans. Since I wanted the sentiments to blend in with the papers a little, I chose inks that were similar in color to the paper. It might be a little overwhelming if they were all stamped in black. Now for the flames, can you guess where these came from? 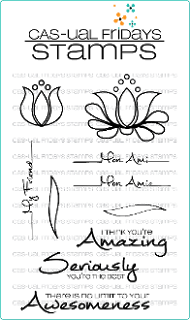 I'll give you a hint, there are three parts to this image. 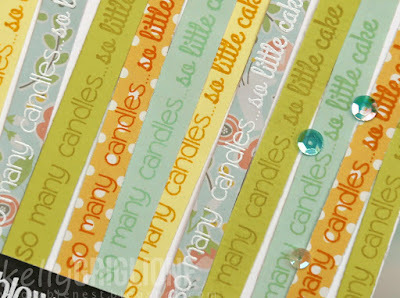 It's the small floral stamp in the Mon Ami set! I colored it with copics, then fussy cut the three different sections, and added them to the tops of each candle. Candle complete. I hope you enjoyed this project! Thanks for looking! This is so fun! And, unique. Love it. Very creative and awesome card, Kelly! LOVE it! What an awesome and clever design, the card is just fantastic! I love how others can see something that I never would (or vice versa) Love the colors too! It's a total celebration! Oh I love these! So fun for a birthday card! 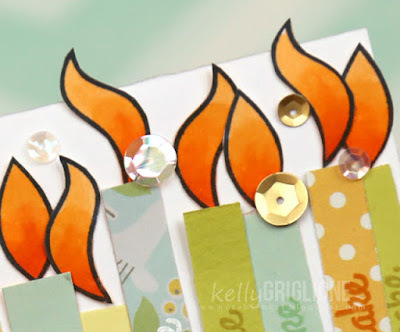 This card is awesome, I love the tonal stamping and what a brilliant idea for the flames. This is such a fun keepsake card. Just found this on Pinterest - must have missed it...What a FUN card!!!! You are the best on that CASual Friday team!